The army club, Spartak Moscow was embodied by the goalkeeper of the USSR national team, Anatoly Mikhailovich Akimov, who even 40 years later continued to speak with great reverence of the Stalingrad players. But it was not Akimov who was the hero of 1943. It was Konstantin Vladimirovich Belikov, appointed captain in 1939, who somehow became one of the chief protagonists of the historic match. Back then coaches had only begun to obtain the powerful, indisputable rights they have today – it was the captain, along with the team's mentor, who managed the complicated game policy. In 1942, the captain of the Stalingrad team had been catching saboteurs, parachutists, rocketeers and other vermin. He had also taken brief courses – one couldn't study too long – in blasting. Had the enemy penetrated the southern part of the city, Lieutenant Belikov would have blown up a section of an enormous factory without blinking. "And on our street we will also celebrate," Stalin had repeated in 1942, speaking during the 25th anniversary of the October Revolution. The celebration came to Stalingrad, but the leader was wrong: There were no streets left after the epic battle with the Nazis. 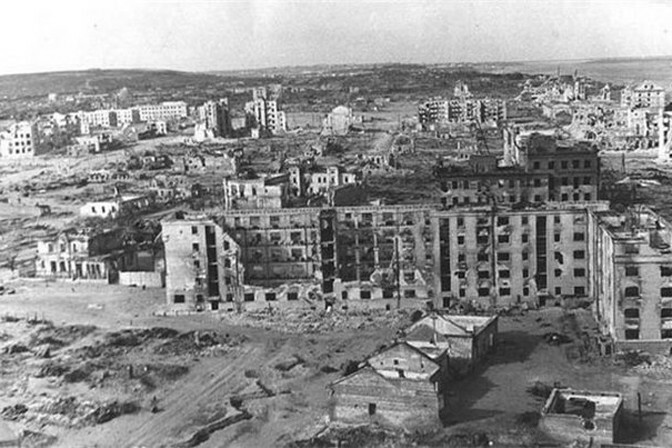 But the Stalingrad residents were home, and the city remained itself. People worked, and work became the battle. The stadium that had once stood near the factory and had been bombed day and night was no more. But patches of the football field with stubbornly rising grass could be found. A part of the field had been transformed by the Germans into a cemetery with crosses and helmets. The workers started digging, cleaning up, realizing that the graves had been mined. The Traktor players were among the first to return to the city, though two of them had lost their lives in the battle for the city. For some the return was purely conditional. Taking the road leading home from the frontline, where they had been fighting since September 1942, just took a few minutes. And no one really had any homes anymore. The survivors walked barefooted through the ruins of the city, digging in the wreckage, looking for rags, fragments, and pieces of furniture. Food was prepared on fires. But very few complained. The idea of organizing a football match in such conditions was audacious indeed. 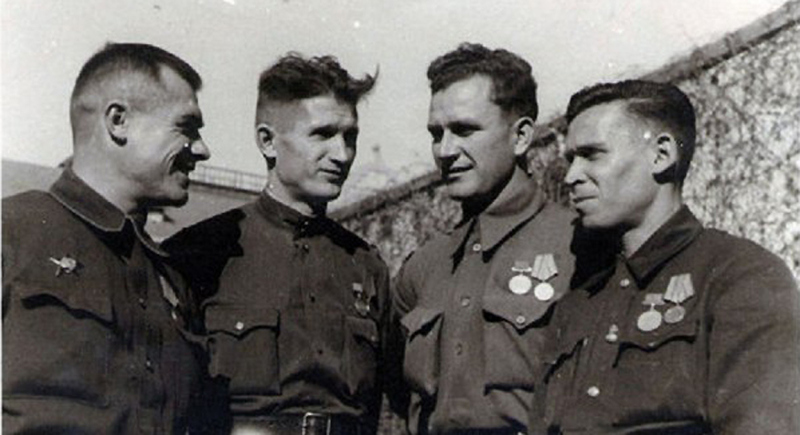 At the beginning April 1943 goalkeeper Vasily Yermasov met with Lieutenant General Voronin. The huge, almost two-meter-tall Yermasov had terrorised strikers with his lightning pace before the war, despite weighing 100 kilograms (almost 16 stone). Responding to Voronin's question about how to celebrate International Workers’ Day on May 1, Yermasov eagerly said "We must play football." It was decided to arrange a game for May 2, 1943. In the southern part of the city they found a relatively well-preserved stadium, the Azot. The players arrived there after the sappers, whose work did not go in vain – the passages to the Azot were mined. Instead of physical preparation, the players filled deep holes in the center of the field and the track around it. Only a week earlier had the artillery removed the heavy long-range anti-aircraft guns from the stadium. Rumors spread quickly, and the people of Stalingrad heard of the training sessions. Locals flocked into the stadium. In the space of several days before the match a thin stream of people with stretchers turned into a disciplined volunteer unit under the command of Yermasov and Belikov. By the middle of April there were 13 players. The players trained on the uneven ground after their long shifts at the factory and dangerous duties at the operative department. They came to the first training session wearing whatever they had – no one was embarrassed of their patched tank tops and bowl-like boots. Belikov was named as captain of the team. The players had nowhere to live, but they were given a generous gift, one they had not expected: They were allowed to call back their evacuated families. About a week and a half before the May festivities the families arrived by steamboat. No one had been so happy since before the war, said Belikov, who shared a gatehouse next to the stadium with three families, a total of 14 people. Originally everyone thought that Traktor would meet the Dynamo team from the capital. But Moscow's Dynamo was dispersed – some were fighting at the front, from where they could not be called back. Then Vasily Yermasov surprised Belikov with the news that they were to play against Spartak Moscow. The Spartak players were called up and told to fly out on the night of May 1. When they arrived, goalkeeper Akimov could not believe his eyes: They were met not only by those whose duty it was to meet them, but by dozens of fans. Two fans, Akimov remembered, came to the airport barefooted. No one could understand how the fans had found out about the special football flight. Belikov, however, remembered that a week before the match a poster had appeared in the city, the only one in Stalingrad. There was basically nothing to paste it to. But it was written with violet ink on blinding white paper, a rare sight during the war. The Traktor players were worried: Would the people come and watch? How would they play? They mustn't lose. They had been getting up at 5:30 a.m. and practicing before work from 6:00 to 8:00. Then they would run to the stadium in the evenings after their shifts and play in the spring twilight. Spartak keeper Anatoly Akimov, a master between the goalposts, warned his friend Belikov: "Kostya, you'll have it hard." "We'll see. I hope the people will come," replied Belikov, hiding his concern. The players worried in vain – on May 2 the people came. Benches were placed for about 3,000 spectators, but about four times that number turned up. Entrance was free. When the players looked out from the dressing rooms, everything was almost like it had been before the war. Before the game, the ball was thrown down onto the field from a dive fighter by a young pilot named Alexei Druzhkov. The stands were rocking and applauding as General Skokov presented Yermasov with the Medal for Courage, and the line-ups of the teams also made the fans happy, with the home team including stars like Yermasov and Belikov, as well as other well-known players such as Fyodor Gusev, Georgy Shlyapin, Savva Pelikyan, Leonid Sheremet, and Alexander Moiseyev. However, Spartak had plenty of match practice and had won the Moscow Cup the year before. Belikov was worried about his team: Would the players have enough strength to play? Spartak attacked first and for a quarter of an hour the hosts could not get into the game. The Muscovites kept coming, but two-meter-tall Yermasov towered in the goal like an impenetrable obstacle. Spartak squeezed and pressed, but in vain. Traktor Stalingrad held out, cheered on by the fans. Yermasov shouted louder and louder to the team, urging them forward – and they didn't disappoint him. In the 39th minute, Shlyapin ran down the left wing and launched the ball high to Moiseyev, who drove it beyond the reach of Akimov and into the top corner. "I wasn't expecting that he'd kick it so hard. I could have stopped it,” Anatoly Akimov later recalled of the strike. Despite the best efforts of Spartak to even the scores in the second half, the goal was to prove the difference between the sides: Traktor won the match 1-0. Afterward all the players embraced and helped the tired off the field. And then they couldn’t leave the dressing rooms. They just didn't have the strength. The author Nikolay Dolgopolov received the Sport Media Pearl Award for this article. He has taken third place in the Best Color Piece category. The prizewinners were announced on Dec. 15, 2015 in Abu Dhabi.